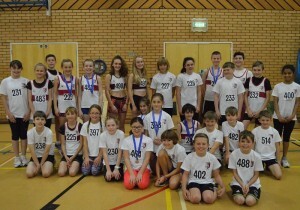 There were some superb results from young Exeter Harriers at the Devon Sportshall County Championships, with 31 medals won across the various age groups, and with the opportunity to represent Devon at the Regional Championships, at stake, all 10 Devon clubs were out in full force at Dawlish Leisure Centre. Imogen Bond was outstanding for Harriers with golds in the U10 1 lap race and the 1 lap hurdles, and silver in 2 laps, with Evie O’Brien also performing well with a silver and 2 bronzes in standing long jump, chest push and javelin, Isabella Peyton-Jones claimed gold in the chest push, and Evan Murray took bronze in the 2 laps. Sam Mills had an excellent day with gold in the U11 4 laps, silver in 2 laps and bronze in high jump, and Gus Tiernan won silver in the standing long jump. Emily Adcock claimed gold in the vertical jump and Natalie Charity won silver and bronze in the chest push and soft javelin. The U13 boys had a strong team, with Craig Moncur wining 2 golds in high jump and shot putt, Mathew Williams claiming gold in standing triple jump, silver in high jump and bronze in vertical jump, and Nathan Blatchford took silver in standing triple jump and bronzes in high jump and 2 lap hurdles. Abbie Freeman won gold in the U13 shot putt and bronze in standing triple jump, Brooke Coldwell claimed silver in the 4 lap race and Jasmine Stone also took silver in high jump. Josh Tyler won gold in the U15 shot putt, Lynne Robertson took silver in the speed bounce, Andrea Gilbert claimed bronze in vertical jump and Alice Please also won bronze in shot putt. 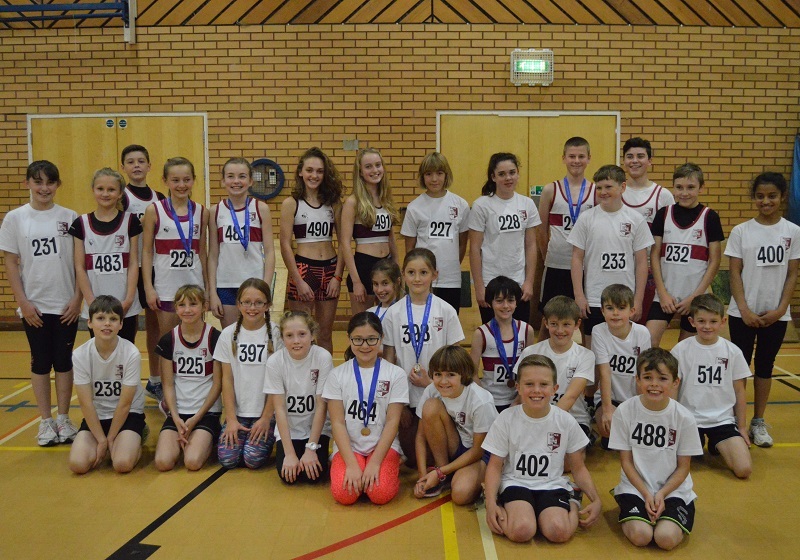 Sportsthall Athletics is a fun, indoor inter-club competition for age 8yrs to 14, is recommended and endorsed by England Athletics and provides an essential component of the competition framework for athletics. Email sportshall@exeterharriers.org.uk and come and join us for a training session.